August? Already? How could this happen? What about July? July zoomed by for me. Good thing I had that beach campout otherwise it would have totally missed me. Still, lots happened in July at The Carpetology Blog, which gives me an excuse to do The Carpetology Blog Roundup for July, 2008! On the red carpet front, we had a story that connected directly with the industry: Red Carpet Event: Karastan & Joyful Heart Foundation. Please, if you know anyone who has lived through sexual assault, domestic violence or child abuse, direct them to The Joyful Heart Foundation. For those of you wanting desperately to Be a Red Carpet Reporter!, did you make the deadline? Carpet is an important element of World Culture... Can you imagine how big the world's largest carpet would have to be? I couldn't until I read In Search of the World's Largest Carpet... Then, there's Yellow Around The World and Biomimicry And The Art of Nature. Were you aware that a major carpet event is coming up in August? It has to do with the Tapis de fleurs de Bruxelles [and I'm hoping that Solutia associates in Louvain-La-Neuve will be successful in sharing their perspectives with us. This is a BIG deal in Bruxelles.]. We also offered an historical carpet perspective For July 4th: The History of the World (in terms of carpet). We added to the Carpetology Wear-Dated Website Guide with information on Subscribing to the Newsroom. + A Foot's Perspective - Episode 9 from NeoCon and the Chicago Merchandise Mart. Ann Hurley discusses the concept of 'contrast' with four carpet introductions from our Ultron showroom. + A Foot's Perspective - Episode 8 also from Chicago. It offers a quick glimpse of the flooring in the Sears Tower. Well, from one room in the Sears Tower. What makes a brand? A quintessential question that recently profiled Woman in Flooring - Lisbeth Calandrino - asks and explores in the following guest post. With sales down in almost all categories, businesses are wondering: what makes a difference to customers? Businesses talk about their brands and brand recognition. In times like these I wonder: what makes a brand? In 2004, Al & Laura Ries wrote a book called The Origin of Brands: How Product Evolution Creates Endless Possibilities for New Brands , in which they talk about what builds a brand and what keeps it going. They have interesting thoughts. One is called divergence: take an existing brand and look for opportunities to create new categories by diverging existing ones. I think this is something for flooring retailers, many with long-term brands that haven’t changed one bit. Another interesting point in the book is that a brand dominates, and that name alone can represent the primary reason for the brand’s success. Think about Coca-Cola - the world’s most valuable brand because it dominates the cola category. It has since branched into water, sports drinks and the like. Why do we buy these new “names?” Because we know Coca-Cola stands behind it. Think about Starbucks. This company started out as a “coffee brand” which was able to launch into music, coffee “stuff,” gift cards, etc. Is this a mistake? Well, we know that if you are going to branch off into new brands you had better keep the old brand solid. If Coca-Cola became tainted with salmonella, there wouldn’t be anyone drinking Dasani water. This may be where Starbucks made some errors: moving away from their core brand. Anyway, I decided to go out and explore some brands, both living and dead, to see how what makes those brands big brands. Last weekend, two big brands were in town: Elvis Presley and the Temptations. Both brands were big in the 1950s, and continue to bring in audiences. 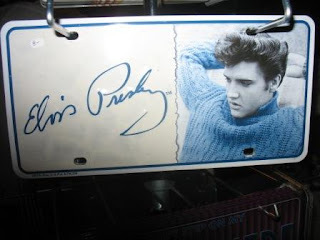 One of those big brands, Elvis Presley, actually died in the 1970s, but continues to live in Memphis with thousands of fans visiting Graceland every year. In 1954, Elvis Presley was asked who he sounded like. His reply? Nobody! The start of a new brand. Even John Lennon said before Elvis, there was nothing. With that in mind, I set off to see if there really is a “dead” Elvis brand. On Friday, I traveled to Lake George, NY to get a glimpse of the Elvis festival. Sort of tongue and cheek, I wondered why 4300 people descended on this summer resort to dress, sing and parade in their Elvis finery. The first thing I noticed is that I couldn’t find a place to park. 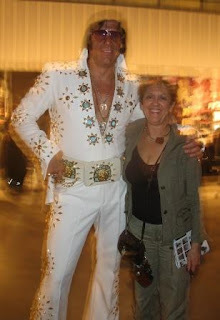 I cruised the parking lot as Elvis clones walked around: tall, short, young and old—even fat Elvises. I finally double parked the car and decided to interview a 60-year-old Elvis. His name is Aaron. He’s from Buffalo and has been an Elvis “aficionado” for over 30 years. With a great smile and good sense of humor, he says he just loves Elvis. I ask him what makes Elvis live on, and he says, “It’s all about emotion.” Elvis was the first to show it and connect with it, he continues. Having grown up with Elvis, he represented his own emotions; in fact he was really the only emotion around. People take Graceland and their Elvis festivals quite seriously. Next, I go to another part of the festival in and sit through 30 performances by Elvis impersonators. Wow! Elvis is represented in each stage of his life, including his time in the service. I gaze around the crowd and realize the place is filled with women of all ages, but mostly 40-plus. Another wow. I thought: these are our flooring customers and they’re all at the Elvis festival. If I had suggested that a retailer have a “sing and look-alike Elvis night”, they would have thought I was crazy. But here they are all gathered at an Elvis weekend. 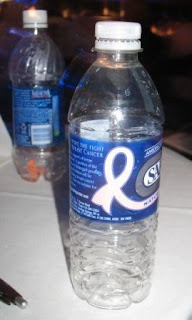 The other thing I notice is: the water bottles on the table all have the “pink ribbon” logo. In 1995, Jane Weiner, a professional dancer in New York City, learned that her sister, Susan Rafte of Houston, had been diagnosed with breast cancer. Jane joined with friends and fellow dancers David Parker, Sara Hook and Robin Staff, to launch the Pink Ribbons Project: dancers in motion against breast cancer. Together, they put together an event in New York City to raise enough money to send breast cancer survivors to testify at Congressional hearings. The 19th annual Susan G. Koman National Race for the Cure drew nearly 50,000 runners. Susan G. Komen has become a very big brand. Two big brands that are co-branded! It’s not just that one and one make two. One and one make three—bigger and better. I continue to hang out with the Elvis crowd and continue to ask “why Elvis?” Because Elvis is all about emotion and connections, they say. You just want to be with him and be part of him. Forever. Every time I go to Memphis I have to stop by the King’s home. Why? Because it’s there and somewhere deep down Elvis is a part of me and my emotions. On to my next brand, mostly alive: The Temptations. Actually one of my favorites. 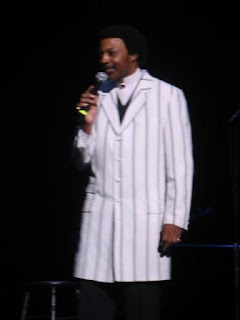 The Temptations, traveling the country since the 1960s, seem to change faces but the voices are still as strong and vibrant as their clothing. The dance steps haven’t really changed, but the outfits seem to have more versatility—a black and white striped blazer added to the lime green suits. The music is the same. It brings audiences to their feet. I am a big fan of the Temptations. I saw them at the Riverfront in Catskill, NY last summer and at the Palace Theater in Albany the year before. I noticed the audience was comprised of both men and women, aged 30 and up. The group performed for 1 hour and 45 minutes straight, no breaks, and that was it. Of course they got a standing ovation and came back for two more songs. 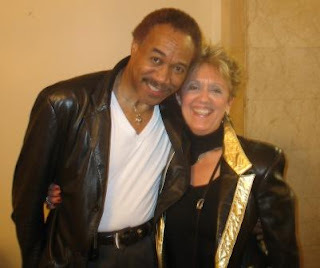 After the show I caught up with one of the lead singers, GC Cameron, who actually comes from another great 60s group: the Spinners. I asked him what makes the Temptations live on. He responded simply: the emotion of the music. People just love it. It touches everyone’s hearts and they remember the songs. People just automatically jump to their feet and transform themselves back to the 60s with their own original scores. So branding is about emotion. Does your brand evoke emotion? Bring people to their feet wanting more and more? Cirque du Soleil has created a new brand of circus by diverging from the original circus by borrowing ideas from Broadway shows. By the way, Cirque is planning a tribute to Elvis in the next year! So, how important is the brand to your business? It would appear that if you do it right, nothing else really matters. What does “doing it right” mean? How about, for starters, that you connect with your customer? All customers connect differently, so you have to know your customers. Find out what they want, then give it to them. (Both Elvis and the Temptations knew their customers—the youth of yesterday and today.) Have a great product, keep updating and changing your product, but never forget its history. Don‘t forget there are people who will like you the way you were. Brands have to stay new and fresh, but still retain their core values. When I think of our industry, I think of Karastan going back to 1928 but continuing to update and connect to today’s consumer. I think of Thom Filicia (whom I saw in Boston last year) talk about building your room from the “floor up.” I also think of Kelly Preston, John Travolta’s wife who also represents the Karastan brand. Continue to build your core brand, keep it solid and connected to your customer. Don’t know if it’s connected? Conduct a survey and ask the customers you have lost why they left you. What didn’t you do that they found elsewhere? Remember that if you're brand "gets tarnished" it takes a lot to get it back, but it's not impossible. There was the Kobe Bryant brand that went from a very unpleasant incident to MVP. If you work hard enough at it you can reclaim your reputation and your image. Make your connection emotional. Show your customers that you like them and you will go out of your way for them. Continue to make your products better than everyone else’s product. If it isn’t different, the differentiating factor will be price. Who wins then? No one! You might think the customer wins but since you have devalued the product by dropping the price, she’s still not sure she got a good deal! Remember: a brand is a promise to the customer. The promise is: I know the brand will always deliver and I will consistently get what I want. This is the business version of patriotism. So, how does your brand measure up? Like my mom used to say, all you've got is your name so keep it clean! What makes a brand? According to Lis, emotion, connecting with your customers, keeping your promises to customers, being relevant to their lives, being authentic. The business version of patriotism. Wow! I hope you're inspired now to ask yourself what makes your brand. Our behavior as consumers is fascinating, particularly as it relates to home trends. Unfortunately, we tend to be too close to fully recognize changes. But, when we do get a chance to step back, it's wild to realize that we, too, demonstrate trends in the home. This post represents the convergence of three threads: the Consumer Trends at Home section of a Richard K. Miller & Associates 2008 Consumer Behavior report, observations and discussions with friends and my daughter's teacher, and a discussion with Ann Hurley, Woman of Wear-Dated and Ultron, about Home Trends. + Creating living rooms [vs. a living room] and color efficient/light infused homes. + Affordable luxury and greater ease of color and product selection. + Colored neutrals from the mixing of warm and cool in the same color scheme and material-based colors. More people today are creating living rooms-rather than a living room in their homes. We truly live throughout the entire home via the use of wireless Internet connections and many who work at home have multiple types of electronics in almost every room. This creates the need for more color efficient homes--those infused with light and life! One trend we see is "affordable luxury" and it's available at any of the mass marketers. The key is recognizing and coordinating products. That's also much easier today. The retailing trends tend to coordinate products into collections which help the consumer make wise choices in interior design. 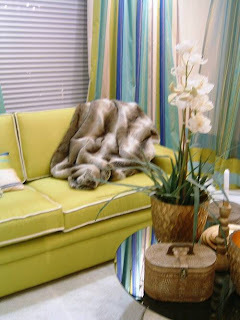 Everyone wants the luxurious look and feel of a fine resort or hotel in their home and it's readily available. The other trend we see today is the mixing of warm and cool in the same color scheme--maybe a cool sage and khaki used with an accent of a softened gold. Today we talk about colored neutrals--material based colors that represent natural materials or substances--take note of the multiple metal finishes available in the market today-- warm to cool based --red to green tinted-- brushed, high luster, or anodized. These trends influence the colors selected in our homes. These are often referred to as complex neutrals--a colored neutral influenced with many colors. Neutral may sound dull but not these new colorful neutrals. They range from sage green or golden wheat to cirrus blue and many colors in between, but still tend to give a neutral foil or background to the interior color scheme. The notion of rooms in a home reconfigured for better living intrigues me to no end. My daughter's teacher observes that, in her 20+ years of teaching, she considers the biggest culprit to learning and behavioral issues coming from the lack of communal spaces where families come together to interact. Large sprawling houses mean that the inhabitants occupy different ends, only occasionally meeting in the middle. RKMA reports, according to Albing International Marketing, that the dining room is morphing into a 'multi-use space within the American home.' In my house, the dining room - except for Thanksgiving, Christmas and New Year's - is where my daughter does her work. It's close to the kitchen, so we can supervise. Lately, I've removed half of the strange stuff [projects and miscellaneous constructs] she has created to make room for me to spread out a bit, and do work while she is busy. It's a relaxing work space. The report says that dining rooms are evolving into home office spaces. The dining room table easily transitions from conference room table to work station or school room. Possibly even all at once, making this a true full family communal workspace. Family rooms, too, are morphing into "whole-family office[s]" in reaction to those large sprawling houses where family members each go off into separate directions. They now come together in that space. At the same time, the kitchen remains an important gathering hub. Regardless of what's happening with the economy and housing, these home trends remain relevant. Perhaps even more so as we figure out how to do more with what we have, and want what we have to be as inspiring, effective and comfortable as ever for us and for our entire family. Imagine roughing it for a night, under the stars, on a beach. No air conditioner hum to mask the sounds of bullfrogs and cicadas. Sand guaranteed to find itself everywhere. Clothes heavy from humidity. Really bad hair. That's what I did Saturday night with my daughter on the beach of our community lake, taking part in a campout for kids under 8. We brought the basics, as you can see in the photo: a tiny IKEA kid's igloo under the canopy [in case it rained]. My daughter slept in the igloo. I slept outside in the blue sleeping bag. Roughing it may be an exaggeration. However, for one 12 hour period from 7pm to 7am, we were outdoors, open to the unexpected. It turned into the adventure of a lifetime! At 7pm, we were officially allowed to chase off swimmers and beach loungers to set up camp. That marked the adventure's beginning. It didn't take us long to get settled, which allowed me the luxury of sitting back in one of those green chairs to watch the other tents go up.... Many fathers struggled mightily as they put up the tents and herded offspring to assist. The bigger the tent, the more able bodies needed. The more bodies needed, the less the kids were effective. I admit I felt lust grow in my heart when I caught sight of a tent with separate rooms. I chided myself for not considering an inflatable mattress. I was impressed that tents now come with fans and mini-fridges. However, unlike many of the owners of those big person tents, I didn't lose my temper, wasn't sweating, and was fully relaxed. So was my daughter. The kids became fully engaged in activities. The lifeguards took charge with tug of war contests, scavenger hunts, relay games. After pizza, we all gathered around a camp fire for stories and jokes. Many kids stood up to share scary stories [The Green Ribbon] and knock-knock jokes. My daughter did so repeatedly. As it got darker, the real ghost story telling began with the local version of the tale of The Purple Bishop. We heard screams in the background. Strange noises off of the lake waters... and enough truth to leave everyone wondering. Luckily, s'mores and a movie [projected against a sheet] kept the ghosts at bay. As the beach quieted down, I caught site of three brilliant white swans gliding ethereally on the glassy, glossy lake waters. I couldn't help but think of E.B. White's The Trumpet of the Swan and Sam Beaver's first encounter with his Trumpeter Swans. Morning came quickly. We packed up. The beach returned to normal; just a few fishermen left either on the dock or in boats. The magic, though, remains and my daughter can't wait to do this again. Neither can I.
Adventures such as this one get you thinking. Thinking about what's truly important, and what's not. About getting down to the basics and focusing on what really matters. Sure, I woke up stiff and groggy, with body parts protesting. But, I also woke up seeing the lake as I had never seen it before. I had hoped for a photographic view of smoke on the water. Instead, I have a vision of white swans. And an appreciation for those basics. I hope you're getting down to basics. I guarantee that those basics will take you to new levels. Reach Out! originally uploaded by ~diP. 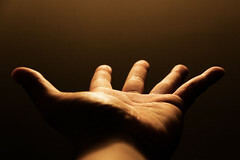 'Reaching out' or 'outreach' carries with it the notion of extending help to others, often those in need. From a social media perspective, outreach has to do with offering relevant value to the social media community. If done well - with humility, transparency and sincerity - you establish a relationship, with all of the benefits that come from long term relationships, and all of the responsibilities, too. Outreach makes increasingly more sense when consumers value word-of-mouth recommendations far more highly than they do corporate pitches. However, it also requires an approach counter to traditional push and mass communications. BlogHer Business 2008 presented several fascinating social media outreach examples where companies had 'reached out' to bloggers to get word out to the marketplace about the value they have to offer. One panel, moderated by advertising exec and momblogpreneur Liz Gumbinner, with Susan Getgood, Mir Kamin and Maria Niles, examined how best to reach out. The reason: the old marketing paradigms no longer work. The traditional shotgun public relations approach is wrong for the social media community; it generates mostly irrelevant and impersonal pitches that aren't welcome. It's time, then, to improve outreach efforts. Bloggers are not journalists. Rather, they are customers and also editors. Don't speak rudely to bloggers as they are your customers. Rudeness to them suggests that you just don't know how to interact with any customers. Getgood shared her principles or The Four Ps of Social Media Engagement: Prepare - get to know the blogger; Participate - be part of the community; and only then Pitch or Publish. Good engagement means that you read the blog, cultivate relationships, know the content, make no hard pitches, and make it clear that your are aware of content/tone/humour. It also requires that you give back to the blogger. Don't ask or expect anything. Be transparent. Interestingly, these are also the approaches that work best in marketing to women and in cultivating relationships with your women customers. Next, we learned about the efforts that several major companies are involved in. Last November, General Motors approached podcasters The Manic Mommies about sponsoring the first-ever Manic Mommies Escape Weekend. GM’s sponsorship focused primarily on providing transportation options to attendees. Jill Whalen interviewed GM's Natalie Johnson about GM's strategy for this kind of sponsorship, and Manic Mommies' Erin Kane about why Manic Mommies accepted GM's sponsorship, and how they responded. Graco represented another fascinating case study. Graco, a 52 year old company, has built a reputation around its childcare products. [I have a slew of them either in use or in the attic -car seats, strollers, booster seats, pack/play, .... They are functional and dependable. I trust that they will keep my child safe.] Elana Centor took us through the story of the Graco Get-Together program, with Graco's Lindsay Lebresco, her agency Converseon's Christin Eubanks, and one of the bloggers on their outreach list, Beth Blecherman. Lindsay explained that the Graco Get-Together program came out of wanting to humanize the brand and show that Graco is a company run by parents. Read through the Graco Blog and you'll experience for yourself the humanity captured there. Before getting started, though, she spent a great deal of time listening to conversations on message boards, forums and blogs, to guide the social media strategy. Graco sponsored the first Get-Together in San Francicso working with Silicon Valley Moms [6 bloggers]. The Get-Togethers are opportunities to meet the contributors; offer value; get reactions to products, and have a conversation. Note the Flickr group with photos of this and subsequent events in other cities around the country. These are soft sell events. Graco via 7 company bloggers has been blogging since late 2007. Lindsay is the lead blogger, with 60% of her time spent on social media and 40% of traditional public relations. Her blogger presence helps establish trust with bloggers. A customer service approach helps guide the relationships. Next, Susan Getgood presented Hewlett Packard's blogger outreach example around HP's Photo Books. She was the consultant on the initiative. She, HP's Victoria Naffier and one of the bloggers on their outreach list, Liz Gumbinner, shared the HP story. The project represented a major culture change for HP, away from talking about themselves and pushing only sales, instead looking at users. At the same time, the company was transitioning from being a printer company to a printing company. By looking at how people used Web 2.0 and combined on and off line to express themselves and share memories, HP learned a great deal about users, obtained valuable product feedback and created relationships all supporting the printing company transition. The overall project sounded impressive in its scope [read full notes below], with thousands of moms being involved in product trials and reviews. Susan interviewed several of the blogger participants about their love of cameras, publishing the interviews on Photographic Memories. Also check out the Flickr group which includes some amazing photos! 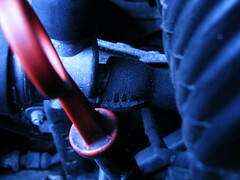 The results of the program were phenomenal: the main promotion took place via outreach and hp.com. HP significantly exceeded its online sales goals [i.e., they were 10x better than expected]. This next case, I found particularly fascinating as I've been somewhat aware of the product/company, but never fully understood it. Anna Boyarsky from Method, Amy Cotteleer from their agency, A Squared Group, and one of the participating bloggers, Kathryn Thompson described the Detox Seattle program introduced by Method, which manufactures environmentally friendly home care products. Mary Hunt moderated. Method was founded 7 years ago in San Francisco and makes earth friendly, counter top friendly products in recognizable shapes. The products have substance and style. They've also become closely associated with Target. Their goal was to do good in "detoxing" Seattle, but also to build business, by generating word of mouth about Method and by signing up new Method Advocates. The results of the outreach program were stunning: a huge increase in Method Advocates, lots of online chatter...and nearly 1000 pounds of toxic chemicals collected and safely disposed of. Method believes strongly in grass roots marketing. Although they do some print advertising, budgets are limited. Through grass roots marketing, they aim to get the product into the hands of advocates. That helps to overcome the assumption that Method is only available at Target. The first 'detox' event took place in a greenhouse in Seattle and offered the opportunity to bring the brand together in 360 way. Method infused their brand dna within the space. 50 mom bloggers were invited to take part in an event celebrating 'cleaning like a mother.' Next was Boston, then NYC, and Minneapolis. The project has been part of a bigger community story, about lifestyles and choices, where participants are offered something of value. Check out the people against dirty community! Finally, Nelly Yusupova moderated a panel with three prominent Microsoft bloggers: Ani Babaian, Sara Ford and Ariel Stallings about how their Microsoft blogging builds a bridge between the world of corporate social media engagement and their own personal technology passions. Microsoft has a history of sending employee bloggers out into the online community to foster better developer and user relations. Nelly summarized her panel in Microsoft Social Media Outreach Case Study. As you think through these examples of social media outreach programs, consider how you might reach out to your most important customers and establish a relationship with them, where you neither sell nor expect anything, but where you offer value. You might be amazed at what you learn about yourself, your brand, your products and your retail experience. There's no other way to describe it. I have a love-hate relationship with my gym. Here's the scary part - at least for the gym - the parts that generate the hate come from the gym establishment. The parts that create the love come from the people I've met. From what I've observed, I'm not the only one to feel this way. I hear similar sentiments when I walk through the locker room and when I set up my spin bike. The gym - Spa 23 - is a full-service gym. It offers classes, a pool, babysitting, racquetball courts, weight rooms... It's not the most glamorous gym, although the recent renovation has significantly upgraded some of the public spaces. [See A Foot's Perspective - Episode 7]. I've been a member since moving to this neck of the woods in 2004. It's not exactly conveniently located [~10 miles away], but compared to the other options closer by [Gold's and Olympus], it has always seemed better. I'm starting to wonder, though. It's a confluence of factors. There's the nasty carpet in the Spinning room. And, then, why is it that gyms so relentlessly focus on acquiring new members? I admire that - to a point. But, why not nurture the existing crowd? There's the renovation saga. I've lost track when it started. It was supposed to start a year or two before it did. Then, it finally started over a year ago. Now it has stopped. From what I hear, the building needs to be brought up to code, with the addition of an elevator. The rumour mill says that there's no money for an elevator. Now, why didn't anyone think of this before the project started? Could it be that those rock-bottom new member acquisition deals aren't generating enough money? Nothing official has been issued, though. Ironically, those of us avid spinners are relieved. You see the space that the new spin room is ear-marked for looks large enough to hold perhaps 12 spin bikes, with no room to sweat. Certainly not the 18 to 24 [depending on how many are out-of-service] in use in the current space where you can actually extend your arms and - if properly positioned - not touch your neighbor. There's also the sense that you're never being told the full truth. I've gotten bumped out of a few spin classes, which irks me to no end - twenty minute travel time each way gets old - when other activities aren't an option [and that was before gas became so exorbitant]. When I last complained, I was informed that 5 new spin bikes would be coming. What I wasn't told at the time, was that 5 [or more] old bikes were being removed. Now I get to the gym earlier to claim my bike. We've transitioned to a summer schedule, but I guarantee that back-to-school will be ugly before the [spin] dust settles. I certainly hope - assuming we transition to the smaller spin room with fewer spin bikes - that my gym comes up with a better system for guaranteeing spin bikes than people 'saving' them hours ahead of time with a paper towel tied around the handlebars. Right now, many of us represent a captive audience. Things are changing, though, with our local bowling alley [only 2 miles away] being converted to a gym. Between that and Gold's, I will have options. The moral of this story: pay attention to your existing customers, monitor what they say about you, and tell the truth. If you have problems, can you come up with solutions that delight rather than create more disillusionment? Finally, keep them informed so the rumour mill doesn't take over. Otherwise, say goodbye to your customers. Megaphones originally uploaded by djfoobarmatt. What makes a successful [corporate] blog? Dan Greenfield from BernaiseSource recently drew my attention to a Wall Street Journal post titled Most Corporate Blogs Are Unimaginative Failures from 6/30/08. It referred to a Forrester Research study (How To Derive Value From B2B Blogging) about corporate blogs. These are the summary points that Corporate Blogs Are Unimaginative Failures mentions: "Forrester found that most B2B blogs are “dull, drab, and don’t stimulate discussion.” Seventy percent stuck to business or technical topics, 74% rarely get comments, and 56% simply regurgitated press releases or other already-public news." I haven't read the Forrester Report; however I do have observations stemming from Flooring The Consumer and The Carpetology Blog, and also the Wear-Dated website Newsroom. Blogs and blogging platforms can make for excellent [corporate] newsrooms. Todd Andrlik has done this for Leopardo Construction, for example. The Wear-Dated website Newsroom is another example. In those environments, the posting of press releases is appropriate, mandatory, necessary and relevant. Otherwise, the point of a blog, corporate or otherwise, is to put forth a perspective, develop an opinion, bring together relevant resources, develop insights and generally offer your audience and marketplace value. It's an opportunity to explain how what you do is relevant to the needs of your audience. Look at what Tim Jackson has done via MasiGuy for bicycles! In fact, MediaHunter just published Social Media Success Stories: Tim Jackson, Masi Bicycles. Perhaps bicycles aren't your thing, but the humour and passion Tim conveys in his blog are guaranteed to capture attention. Let's not forget an interesting aspect about what blogs epitomize: they aren't traditional, push-based mass communications. That's what makes them so powerful. They enhance your traditional marketing, as MasiGuy explains. And, although not everyone will be interested in your musings about screws, widgets, carpet or bikes, those who are will stick with you. They will subscribe; they will come back. They may even comment. Or not. They may email you instead, or speak to you when next you meet. Or simply faithfully listen, and tell others. In many ways, blogs, corporate or otherwise, simplify your communications; they strip down all of the veneer and allow your voice to come through loud and clear. Your voice must be true and strong, it must be consistent, audience focused, and open to others' perspectives. And, you must have something to say, with passion. If you have no passion to share, don't even get started. But, if you do, and - borrowing from Dan's guidelines - you communicate authentically, accurately, respectfully, regularly, openly and commit to being relevant, you will be successful with [corporate] blogging. 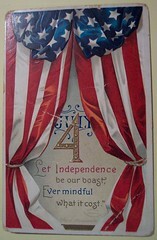 Vintage 4th of July Postcard originally uploaded by riptheskull. May the extended holiday weekend in this part of the world be filled with family, friends, the magic of summer, the glory of nature and plenty of celebration. Perhaps, too, a few parades complete with firetrucks, mounted police and various notables. Lots of flag waving and probably a few crying babies. Definitely picnics on red and white checkered tablecloths with blue napkins, sweating cups and soda cans. The smell of BBQ in the air. Hot dogs, hamburgers and chicken. Maybe shrimp and vegetables? Definitely ketchup. Lots of it. Particularly on the kids. Water balloon tosses that become competitive. The shrieks of kids in the water. The echoes of "Marco?" "Polo" from the older kids. Sand. Sunscreen. Wet towels. Many smiles. NYC 4th of July Fireworks, 2007 originally uploaded by Barry Yanowitz. Lots of running around. The kids in packs, the youngest trailing behind, but keeping up. From the beach to the playground. From the playground back to the beach. Around the dock. Back to the beach. Oh, look, someone caught a snapping turtle! The pack runs to inspect. And the pattern repeats, magically, all day. As the sun settles, anticipation for the grand event grows. Total darkness builds. Fireflies come out. Finally, the band strikes a patriotic tune. Everyone gets into place, children climbing into parents' laps for better viewing. And, then, that first BOOM, that you feel in your belly, physical in its immediacy and visual in its expression of total celebration. 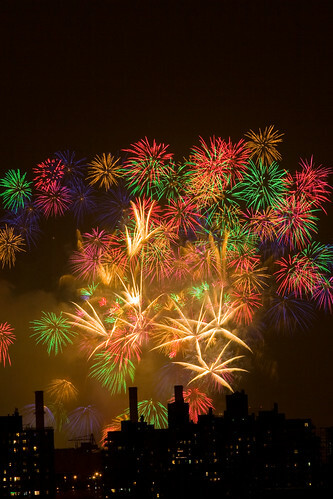 Hurray, the fireworks! Ooooh! Ahhhh! Wow! How magnificent! Happy 4th of July, America! For those of you in other parts of the world, I wish you a wonderful, relaxed weekend. Thank you for reading, subscribing, commenting and generally making this blog possible. Not Going Anywhere - Day 10 originally uploaded by MarkAllanson. "Retail continues to be the dipstick of social change." Those are Paco Underhill's words. He stated them during the 2006 Envirosell Science of Shopping conference. He states them again in the March 2008 issue of DDI Magazine in his 'shopping with Paco' bimonthly column. Those words catch my attention. Inevitably, Paco's words make me think. His March DDI Magazine column, titled "A tale of thirds," makes the following points about retail being the dipstick of social change. + One third of the American population lives from one paycheck to another, with little savings [note this includes middle to upper income households]. For them, "...shopping is going to come to a standstill. Forget the organic produce at Whole Foods; they will buy food at ALDI, Trader Joe's and Wal-Mart." + Another third "is not at immediate risk, but they are scared... This group of Americans is taking pride in spending their money well..." They are the ones doing tons of research on the Internet, asking questions and making sure that anything they purchase captures the full bundle of value that they expect. + The last third is financially secure with mortgages paid off, retirements plans fulfilled. "The recession will have limited effect on them.... They'll go to Trader Joe's because they like it, and to the department store whenever they want." Paco predicts that "the world of shopping is on the edge of a new form of chaos." Why? Because despair from one-third will mean little to no shopping; frantic bargain hunting from the middle third means a lot of channel churning, and from the last third you can expect disinterest because they essentially have all of the stuff they need. 2. "The offering and service proposition need to get matched up. Having hip ads and dirty stores doesn't add up." 3. 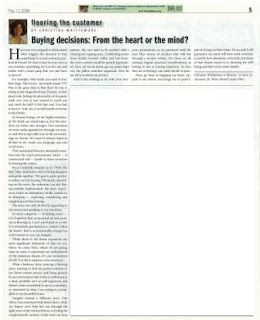 "Decision-making needs to get closer to the actual floor of the individual store... We are an entrepreneurial culture. Give store managers and district managers more control and incentives, and they'll make their numbers." By the way, this 6/02/2008 article, titled Luxury retailers realize it's a new shopping scene. When times get tough, even top-shelf retailers break out their red tags and clearance signs by Sandra M. Jones, says that "luxury pricing power has eroded" and "price has never been as important to the consumer's shopping level as it is today no matter what the income level." + "At the core, the blurring of luxury and moderate and discount lines has created a savvy shopper who moves between Target and Barneys New York with ease and is proud to crow about finding a deal..."
+ Younger 'aspirational' shoppers have started watching their spending while their parents prefer to spend on experiences rather than more stuff. + And, "an undercurrent in American culture that is dampening the allure of materialism and status as environmental and social concerns take center stage." Reminds me of Paco's thirds. Lisa Contreras, Senior Associate and Retail Group Resource Director, recently invited me to visit her at the NYC offices of Mancini Duffy. She wanted to show me the studio and how her group arrives at decisions, spots trends, makes presentations, etc. You can imagine - I jumped at the opportunity. 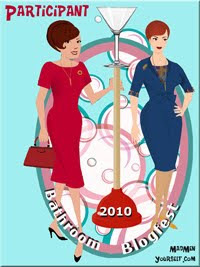 Now Lisa is a friend and has also contributed several posts to Flooring The Consumer: Bathroom Blogfest Brings It Home to Retail, Reactions to the Target Store Experience, and Bloomingdale's Bathroom Makeover. Her retail insight is invaluable, and I hope to share more of it with you. Before joining Mancini Duffy in 2004, Lisa was part of Tucci, Segrete + Rosen. She and her two associates there - Evangelo Dascal and Edward Calabrese - now form Mancini Duffy's Retail Group. Lisa and I regularly discuss the state of retail, consumers' search for experience, and overcoming the dreadful sea of retail sameness plaguing the country. Per Mancini Duffy's brochure: "... Customers, increasingly sophisticated and design-savvy, expect an experience. Shopping is entertainment, wish-fulfillment, a gratification of the senses. And the challenges to retailers are enormous: to provide an ambience that reflects their customers' lifestyle aspirations; to balance familiarity and brand-recognition with continual renewal and surprise; to create stores that are compelling destinations." We got to talking more about department stores, but I thought I should share with you several unique aspects of Mancini Duffy's offices. First, the resource library pictured here. I was mesmerized by the reference wall. So much information captured in one efficient, heavily-used space. Note the range of colors and swatches. In the foreground are other samples, architectural books, and product catalogs with space for browsing. This second photo offers a better perspective on the Library. Note the fabrics hanging in the background? These rotate on a monthly basis and represent new concepts or ideas for the entire location to be exposed to. On the wall immediately outside the Library - which is a highly trafficked area - you will see showcased the office's newest work projects. These are updated four times per year, and offer those not involved in specific projects the opportunity to remain plugged in. In fact, many aspects of the office layout encourage informal sharing of ideas. Lisa said that the current offices had been occupied by a Dot com organization prior to Mancini Duffy moving in, and features communal spaces [e.g., a wonderful kitchen/luncheon/reception area] that have adapted extremely well to the architecture and design vibe. Back to the department store discussion. Lisa explains that department stores went through a period of the doldrums. The SoHo Bloomingdale's store - opened in April 2004 - represented a turning point. The store edited merchandise for specific customers. It also celebrated the iconic use of black "which began in the '70s with the flagship at 59th and Lexington. There, Bloomingdale's Barbara D'Arcy, then head of store design, created the "B'way," a fragrance and cosmetic concourse on the main floor" [from the DDI article above]. The use of black reinforces the Bloomingdale's brand and creates a strong retail identity. Which is what has been lacking: strong retail identity. Lisa has lately been involved in Lord & Taylor. I have fond memories of Lord & Taylor. That's where I successfully found my business school interview suit; where I bought many of my work clothes after business school, including my favorite trench coat, etc... In the last ten years or so, though, it has lost its way. It is now refocusing with the first step being determining what the brand stands for in consumers' minds. After research and soul-searching, Lord & Taylor decided that it is equivalent to American Style. Pictured here are some of Mancini Duffy's renderings for the NYC 5th Avenue storefront. Interestingly, you'll note a front elevation rendering for nighttime as well as one for daytime. These images made me appreciate how important it is to consider the extreme visual conditions that consumers will experience at some point when looking at a store. The final Lord & Taylor image you see is of an interior scene: the show department. It is residential in feel, not just as a result of the fixtures, but also because of the different table styles. Before making any kind of decisions relating to materials or design elements, though, it is critical to determine what is the brand essence of retailer. That begins the project and the process. Once brand essence is identified - with the active participation of the retail client - then the Retail Group works on creating a visual representation of that essence. The visual representation - usually a series of Inspiration Image Boards - serve as a visual guidepost or map that gets everyone onto the same page, and also keeps them there throughout decisions. At that point, Lisa and her team can go into search mode. The goal is not to have blinders on, not to be too restrictive in interpreting product possibilities, but rather to remain open-minded and creative, which leads to unexpected solutions. Next, the group can edit/choose. In the case of Lord & Taylor, what would "American Classic" patterns look like? Argyles, checks, dots, circles.... But, think unusual interpretations. Then, create an implementation document so the final concepts can be built. The last step is on-site sample approval. Lisa mentioned as examples the intense editing that Ralph Lauren, and Barbara Berry implement to keep the brand essence of their products so very pure and consistent over time. In selecting materials to express a retail brand's essence, Lisa looks for 5 year window, although that depends. Mancini Duffy's Retail Group captures unusual creativity. In fact, the rest of the corporate group comes to the Retail Group for ideas. Lisa considers it critical to challenge the people in her group to be open to ideas. to constantly be on the lookout for the unexpected. "We each have our own rainbow of certain colors that we gravitate toward," says Lisa. Making it important to mix rainbows with others'... "If you like something, then experiment with it. Turn texture into a new medium. Let that be your inspiration." + Photos that illustrated the combination of the jewel tones with warm greys and examples of luminous layering combined with glass, etc. I'm also eager to experience more of the new Lord & Taylor. This post - A Rose Is A Rose, Is A Rose - by Retail Design Diva captures some of the magic that we can expect.